Restore sleek, glossy locks with Fudge Luminiser Shampoo; a radiance-reviving formula that works to eliminate frizz and flyaways for salon-worthy results. Combining innovative Opti-PLEX™ technology with a nourishing blend of Argan and Abyssinian Oils, the rejuvenating shampoo gently eliminates impurities and product build-up, whilst replenishing weightless, long-lasting moisture from root to tip. 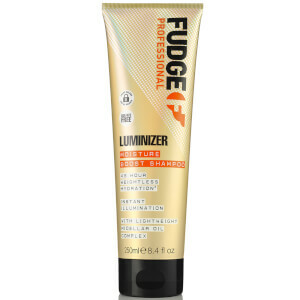 Hair feels refreshed and hydrated with mirror-like shine and a super-smooth finish.